Back in the days of the base Sims 2 game, there were 10 job tracks and searching for your dream job in the Newspaper or on a computer generally only took a couple of days before the random choice of 3 or 4 jobs respectively, came up with your choosen career track. These days with all the new Expansion Packs (and additionally career mods), there are twice as many jobs to choose from and with still only 3 or 4 jobs a day, it can take a week sometimes before your career track appears. The Job Seeking Notice board allows you to select any job directly without trawling through lots of jobs you are not interested in. The job is offered to you in exactly the same way as from a newspaper or computer (using the online job finder), that is, you are offered a job at the appropriate level (based on previous jobs, e.g. as a teen; degree or lack of it; pregnancy) and it checks if you already have a job that you really want to change to this new one. It will not allow you to waltz into the job centre and demand a level 10 job in any career - that's just not true to life. It works for Adult Jobs, Teen/Elder Jobs and Pet Jobs, and for Maxis Careers and Custom Careers. Note: Elder Pets and Spectral Cats (new in Apartment Life) cannot get jobs - just as with other job offering mechanisms. I imagine this notice board being placed in a dedicated "Job Centre" or even just at the back of the supermarket. However, I haven't restricted it from being placed in a residential lot if your Sim is too lazy to even go out to get a job! If you want to get a job for your Pet you must take it with you when you go to the noticeboard - when you go to a commmunity lot just make sure you choose the Pets to come with you from the list. If you want a Pet Jobs only noticeboard you can pick up the noticeboard and place it again and this will cycle round the various configurations - see here for details. I have categorised the notice board as Decorative/Misc to match the open/close shop sign. There is now also a one-tile version of this noticeboard. The notice board was created by cloning a painting. I changed the texture of the picture model to show the job notices, and added the behaviours to allow selection of a job (I guess I'm more into BHAV programming than meshing). 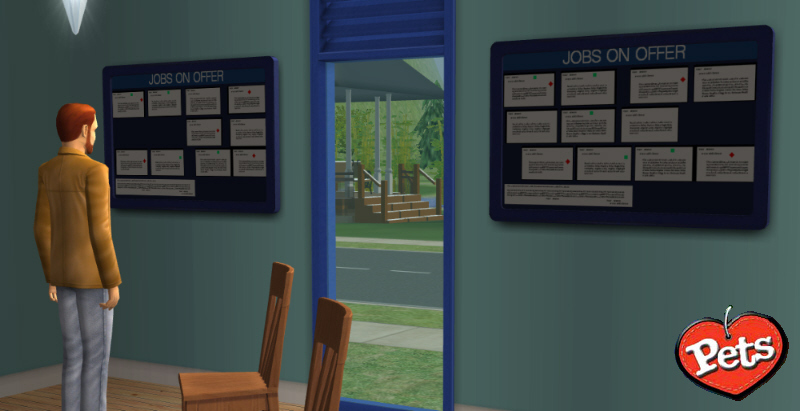 I have provided two recolors which do not have the English text "JOBS ON OFFER" but instead use this "Simlish" font. I have also provided a Pets recolor (both English and Simlish) example can be seen here. Base object and recolors are all found in the attached .rar file. One known anomoly is to do with the dialog used. The code in this object calls a Maxi call tree "CT - Offer Job" which is used by both the newspaper and the computer. I didn't think it necessary to clone it into my object since it works fine, except with one anomoly, that is the dialog that pops up. It has a title of "Online Job Finder" and has two buttons "End Search" and "Look Again" that are effectively "Don't take the job" since on this noticeboard there is only one job in each category. "Take Job" - changes the job your Sim/Pet has (after confirming you want to change any existing job you may have). Sim nods head in a satisfied manner. "Look Again" - reminds you that there is only one job of each type to find and you have seen it already. Please note, this is a rar file. If you don't know what to do with one of those, see here. Fixed routing issue which caused action to get a job to quietly drop out of the Sims queue. Added Pet Jobs to the board and a Pet Job recolor. Added placement options for configuration on non-owned community lots especially (but useful everywhere). ebruere: For this which enabled me to do Pet Jobs properly. This object is fully translated in the following languages thanks to the much appreciated assistance from the following native language speakers. If you play the game in Ukrainian - please get in touch - we are unsure whether there is a Ukrainian installation or not. For any other languages, this object will mainly present you with strings in the language of your installation (due to the fact that Maxis code is being called), but there are one or two strings that are created as part of my object and those are currently in English. If you are a non-English speaker and would like to help me produce a version of this object containing your language strings - please go to this thread to provide translation assistence. Credit will be given. These recolours may or may not be endorsed by MogHughson.